Cerezo Osaka, a Japanese club playing in the J1 league thought it would be a good idea to get a monkey to perform at the pre-match ceremony before their game against Vissel Kobe. 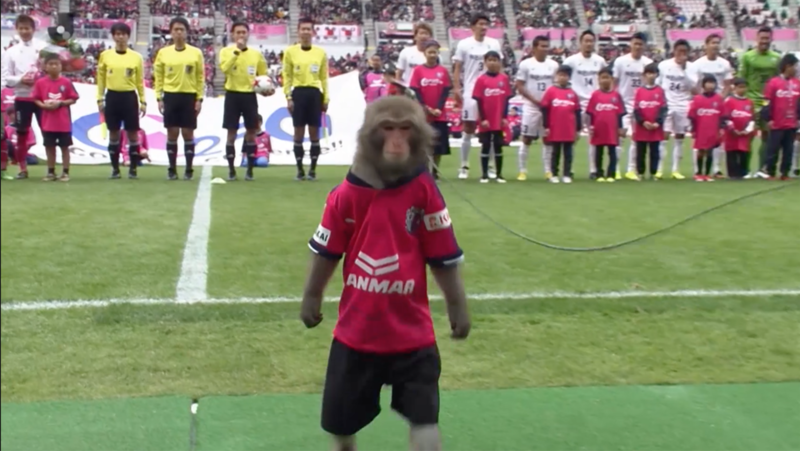 The monkey a macaque was brought out in a Cerezo Osaka shirt attached to a rope that was tied around his neck by a handler. The monkey was then made to kick the ball around the pitch before walking over to the referee and handing him the ball. The monkey’s handler can be seen giving it a whip a handful of times to make sure instructions are followed. The stunt has been slammed by animal rights group PETA and rightly so, animal cruelty anywhere is unacceptable and prodding / dragging a monkey around a football pitch is animal cruelty not entertainment. Cerezo Osaka deserve all criticism they are currently getting for this and should issues an apology if they haven’t already.